Evan and I got to play Due Process a while back and had a lot of fun. It's a tactical team-based FPS that's easily likened to Rainbow Six: Siege. In a series of brief rounds, one team defends from inside a randomized building while the other attempts to breach it and clear them out. The planning stage is especially nice, offering a live, top-down view of the level to draw on as everyone maneuvers into position. Due Process is still in alpha, and next on the roadmap is a total overhaul of its blocky look—something developer Giant Enemy Crab has been talking about since we first met. In the video above from PAX Prime about a week ago, I talk to studio founder Neil Doherty about the new version and what's next for Due Process. There's no release date planned, but Doherty says that it's hopefully "not too long" before we see the new version in action. He also plans to run a Kickstarter campaign sometime after that. I followed up after the interview to get a better understanding of his crowdfunding plans. "It's mostly that Due Process could be a lot better if we had more resources to put into it," writes Doherty. "Right now a large portion of the team is only able to work part time on the game and that makes development a lot slower. We could also definitely use another developer or two. Lastly, we would really like to bring in a sound designer at some point because having satisfying gun sounds is really important to us." 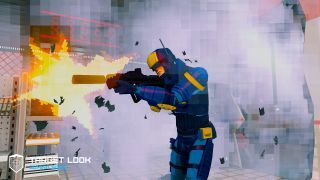 Doherty adds that they've avoided Kickstarter so far because "it would have been really confusing for us to show people our current block shooter prototype and then have them find out later that the game is going to look completely different." Once the new style is in place, he feels they'll have an accurate representation of the game to pitch backers with.